We've all done it. You're looking through the wedding magazines trying to get some ideas for your big day. You see plenty of other people's weddings that look spectacular. Brides holding amazing bouquets. Reception tables complete with flower centrepieces that are just out of this world. But at the back of your mind there's always the same doubt - "I'd love to have stunning flower decorations like that, but I don't think I could afford it." So how can you have stylish wedding flowers without blowing your budget? What would you say if an expert florist, who has created hundreds of wedding flower arrangements, was to take you by the hand and show you exactly how you could create your own wedding flowers? You could easily slash your wedding flower bill in half. You'll also have a lot of fun doing it. Just think what you could do with the money you saved. Maybe you could have a longer honeymoon, or the wedding dress that you always wanted, or that extra special ring that will last a lifetime. But it's more than just about saving money. 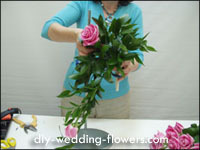 Have a bit of fun in the build up to your wedding day by creating your flowers. Include some of your friends, family or bridesmaids in making the arrangements and make it a 'team effort'. Once you've learnt the skill of creating eye-catching arrangements, you will be able to make the flowers arrangements for friends' weddings, christenings, birthday parties and other celebrations. It's a practical guide written by a professional wedding florist that will have you creating wonderful flower arrangements for your big day even if you don't know a daisy from a daffodil. The arrangements have been specially chosen so that they are easy to make you don't need to have had any prior training in floristry or flower arranging. If you want to learn the correct way to make a simple 'hand-tied' posy style of bouquet, you will find all the details here. Or if you're ready to try a more detailed arrangement, you will find step-by-step instructions on how to make this wonderful cascade bouquet. 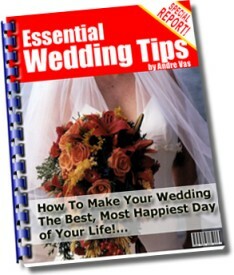 The arrangements in this ebook will look great at your wedding. In fact, they are exactly the type of arrangements that florists regular charge hundreds and even thousands for. You'll quickly gain the skills to be able to create your own bouquets, table centerpieces and wedding bottonholes. It's like a fast track floristry course in creating wedding flowers. You'll learn simple floristry techniques that will have you creating wonderful arrangements in no time at all. Of course we can't show you how to create a bouquet like Lady Diana's in this short space of time. But you will end up with stunning arrangements that your friends and family will be surprised that you made yourself. You don't even need to say that you made them yourself nobody will be any the wiser! What Others are Saying about "Create Your Own Wedding Flowers"
I have looked through the book and I found it really easy to follow and it has some great designs. The pictures were a real help and took me through things step by step. I really liked the 'where to get supplies' section. The section on buttonholes was especially useful for me and shows me in easy steps what I need to do. I am going to be having a go at a Stargazer centrepiece today. A really good ebook, great fun. Well done. I thought the book was very informative and it is an easy read. I really like the fact that pictures are included in every step. The step by step guides provided simple instructions which were clear and to the point - these instructions were supported with good pictures to demonstrate how to create the different bouquets. As I said the book is very good - I have been using it to create some arrangements for the home! Clear instructions are included at every stage, so that you can easily follow along. Everything that you need to complete your arrangement is clearly shown for you. 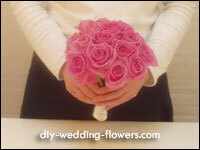 How to make a stylish 'hand-tied' bridal bouquet using pink roses including step-by-step photographs. How to create an elegant arm bouquet of calla lilies and the correct way to hold it. The easy way to produce perfect orchid and rose wedding boutonnieres (buttonholes) for the groom and the groomsmen. How to pin your boutonnieres for maximum effect. Six simple designs for wedding table centrepieces these are quick and easy to assemble but look stunning - Just learning how to do this could save you hundreds. Ideas for creating bridesmaids bouquets that they will remember forever. Professional tips for transforming ordinary arrangements into pieces that look like a designer florist created them. Make no mistake, this guide has been written by a much sought-after professional florist. In fact her services are currently booked up many months in advance. If you are searching the Net for information on wedding flowers, there is one thing you should know. Most of the stuff that you read is written by journalists, copywriters and marketers they wouldn't know how to arrange a bunch of flowers if their life depended on it. If you want real-world advice on how to create memorable flower arrangements, listen to someone who has been doing it successfully for years. 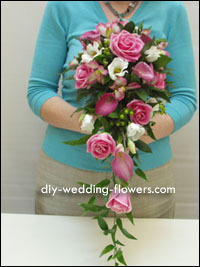 Create Your Own Wedding Flowers is nothing like the fairytale wedding books that you get in the shops. It is NOT full of pictures of models pretending to be brides. It is NOT stuffed with pictures of the most expensive celebrity wedding arrangements that have ever been prepared. It is a no-nonsense, step-by-step manual to producing simple yet elegant flower arrangements that will grace any wedding. And all the time you'll have stacks of photo's to check that you are creating things correctly. I am so confident that you will be delighted with this ebook, it comes with My Personal Satisfaction, No-Hassle , Risk-Free 8 week Guarantee. That's right, you have 56 days to read the information, try out the tips and use the tutorials to create your own flower arrangements. If you are not happy that the information provides everything you need to create your own wonderful wedding flowers, then email me, and you will get a refund. If you have a big budget you can go to a florist and easily spend thousands on flowers for your wedding. But now there is an alternative if you don't have that kind of budget. You can get the skills and tips that you need to quickly and easily create your own wedding flowers, by ordering the ebook Create Your Own Wedding Flowers TODAY. And you maybe surprised that your investment in this ebook is only $15.99. That's less than the price of a cheap bunch of flowers from a florist. And you can use the ebook to save yourself hundreds of dollars. This is a digital download in pdf format that can be accessed within minutes. 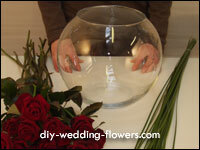 To get your hands on your own copy of Create Your Own Wedding Flowers just click on the link below. 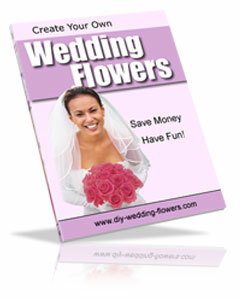 Yes, I want to learn the easy way to start creating my own wedding flower bouquets and arrangements. Once your payment is authorized using Clickbank's secure server (this usually takes less than a minute), you will be given instructions on how to download the complete package. Now you have a choice. You can decide to order this ebook and learn how to save yourself hundreds of dollars on your wedding flowers bill, or you can carry on surfing the Net. What I can tell you is that you won't find anything like this package anywhere. It has been created after spending many hours consulting with brides-to-be, researching which wedding flowers are best to use and designing the tutorial. P.S. Remember you have you nothing to lose by ordering today. If you are not satisfied, you are fully covered by our 8 week guarantee. Give it a try - you'll save money and have some fun!